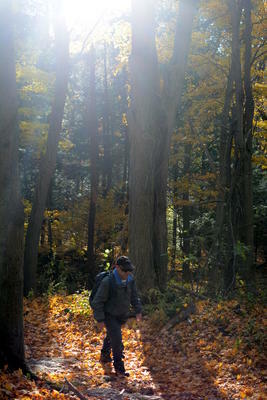 We start at Rattlesnake Point and we hike across the valley to and around Crawford Lake. Portabellos Pizza & Eatery was closed for construction last time we were there. Ned Devine's Irish Pub, 75 Ontario Street South, Milton, ON L9T 2N2, (905.864.6794), turned out to be an excellent place to finish of a day of hiking. This is Derry Road and Ontario Street, on the north west corner. Here it is on Google Maps.